Because I've been home more I've really been on a kick as of late to clean out and really organize everything in my apartment. Slowly but surely we are getting there and my last project was the medicine cabinet! I'll be the first to admit that the before and afters aren't super drastic but I will say they are more realistic! Before cleaning out, I had zero space left and it felt like every time I opened up my mirror something fell out. I don't think I've done a proper clean out since I've lived here! 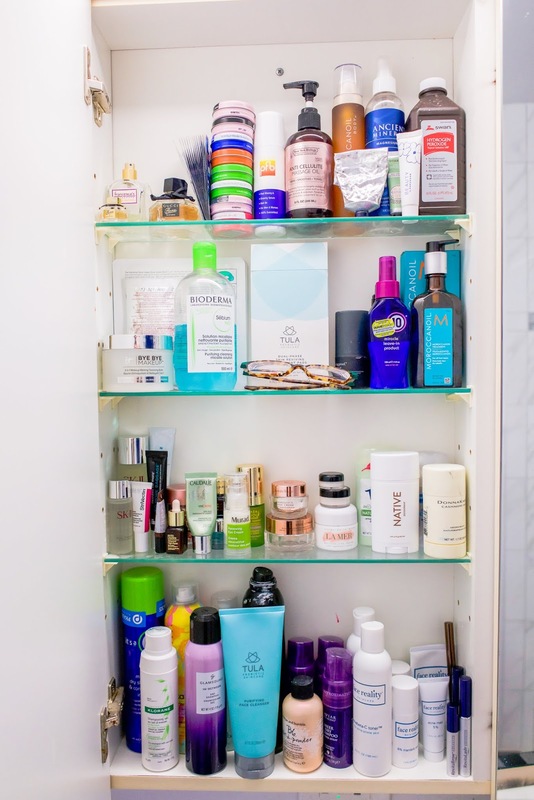 Before we begin, everyone is aware that beauty products expire right? There is a teeny tiny little jar on every product that is found at the bottom or near the bottom with the small fine print, ingredients and bran information. It looks like this and tells you how long (from when you open it) you have before the products start to expire/turn. Especially with things you put on your face, you really should listen to these times and throw out anything that is way past it's date. That's where I started with my clean out, from there I asked myself when was the last time I used it or how did I like it when I did use it. If the answer was not recently or meh, it was thrown away. Anything unopened, new or unused was added to a different pile for donation. Two things really struck me during this process: the first being what to do with these items that are expired/used but still full. Do you just throw them away? rinse them down the drain? I feel like there is no proper way of disposal when it comes to beauty products and there should be! If you know of a good way, please let me know because I did some research specifically in NYC and came up short. The second was how wasteful these large products can be. You have 6 months to get through a TUB of under eye cream? It would be impossible! I think this is partly why I love to shop travel sized items but still... we could get all of these in half sizes and be totally fine. With that little rant, I move on to how exactly I organized it all. 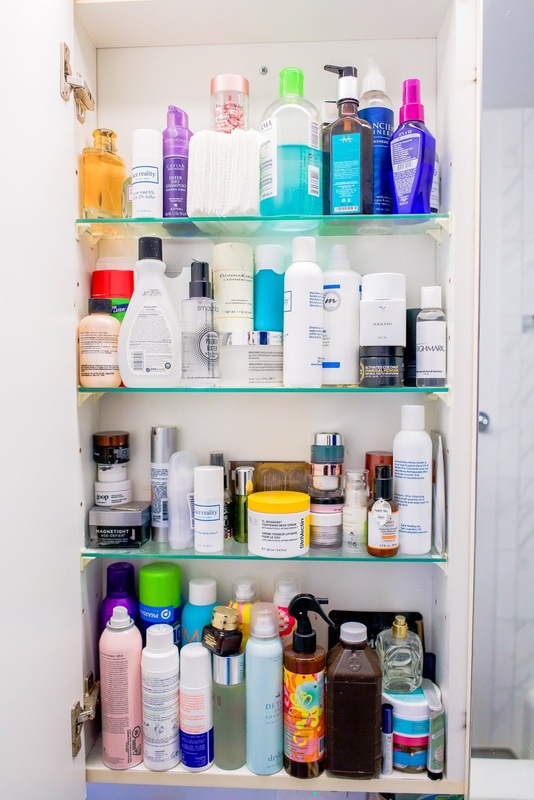 Talking first about my main medicine cabinet -- I have my "main" one which is the middle and holds all my go-to items, and then my second which holds speciality items not used every day, backups and tools. Top Row: Started with my fragrance; I found out I had a lot more perfume that was never wearing (I don't wear it a lot in general) so threw all of it out expect for the two scents I do use: Gucci and Indigo Waters. Next I stacked my Crest whitestrips in a place where they wouldn't continually fall over (which is a real issue) and my Vaseline lip tins. I realize I have way too much of these but I do love them and give them away on the regular! Next to that we have the body oils and lotions. Things to use after showers, on their own and really just a larger collection of tall items that don't seem to fit anywhere else. Second Row: The left side of this row is all the bulky items. Makeup removers (like Bye Bye Makeup and Bioderma) masks, glasses and facial pads (these are the best from Tula and are best stored in their box). On the right we have the hair products and some of my most used items -- my It's a 10 leave in product, MoroccanOil, and Redken hair spray. Third Row: This is where the bulk of the beauty prodcuts live and also where I have the hardest time organizing everything! We start with face and facial items like the SK-II skin essence, Skinceuticals Retinol and Elizabeth Arden retinol capsules. Then we move into under eye gels and creams like the Dr. Brant No More Baggage, Strivectin eye concentrate, Estee Lauder advanced repairand eye cream, the Murad retinol day under eye cream and the Tata Harper illuminating eye cream. As you can see I'm trying to find "the one" when it comes to under eye. Technically I've found it (it's La Mer) but it's SO expensive! Then we get into moisturizer for the face and eyes and the ones that I really only use when doing my makeup (so I have an extra hydrated base for my foundation). I loveeee the Charlotte Tilbury magic cream for this personally and have been using the LaMer here and there but think it's time to throw away (its getting old). And like trying to find the perfect under eye cream, I'm also looking for the best deodorant -- I've used and loved the cashmere skin mist but realize it may be bad for me. I tried Native and got a pretty bad rash that I'm letting detox before trying one more time and also switching back and forth with Toms but still having a hard time finding a natural one that I love. Bottom Row: We start with my loves: my dry shampoo. Each one serves a different purpose for how thick or light or greasy my hair needs to be. My top two most used are the DryBar and the Caviar pump. I also have my Tula facewash in there because I needed to grab it right away but had no other room for it so it's kind of out of place. Behind it, I have my Oribe dry texture mist that I love when curling my hair. Then on the far right we have my skincare routine: my toner (for face and body), my serums, my acne treatments, my moisturizers and my revitaLash and brow serums that I use day and night. I have these on the bottom row corner because they are the easiest to grab and use when at the sink! 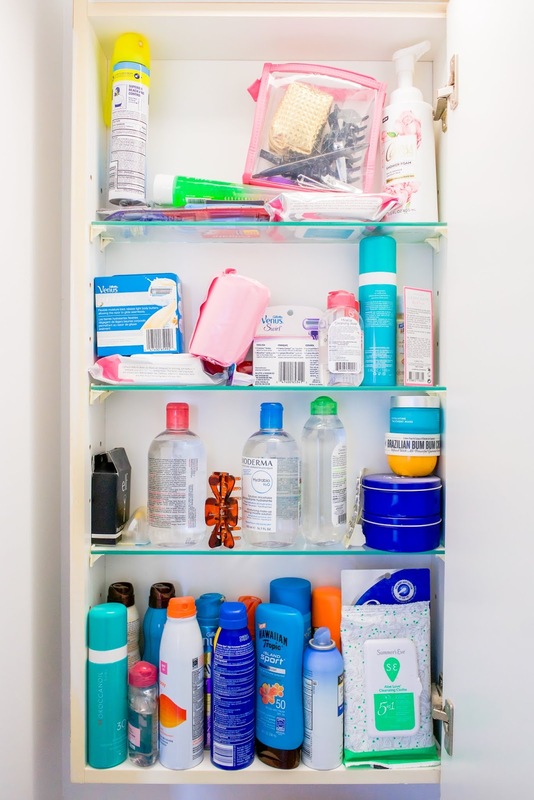 Top Row: We start with the extras: extra toothbrushes, extra body wash, extra makeup remover and extra cotton pads. Then we get into the beauty tools that you always seem to need at the most inconvenient times. Now I know where they are right away! Second Row: I can never seem to find any clips or hairties when I need them so now I have a little home for them whenever I do find them and also have a place where I can easily grab on the go. I use almost exclusively these invisibobble hairties when putting my hair up! Next to that we have shaver head replacements for when needed. A big lover and supporter of anything Venus! Third Row: This is where you can see all the space I have now! I can fit a whole box in there with some room to spare! I keep all my tampons and liners in this box until needed and restock when running low. Next to that we have my very very favorite makeup removing cloths that I use all the time when taking off my makeup. I store them here since there was some extra room and it kind of works. Next to that we have my travel bag just waiting to be taken on the next trip. Bottom Row: Here we have all the summer stuff (miss you warm weather!) like sunblock, bug spray and aloe. Sunblock is expensive and I'm not trying to rebuy each summer so I keep these and stock up! One honorable mention in this group is the pure Zinc Oxide from Sunbum -- this stuff is the BEST at making sure I don't get burnt and it smells so good. On the right we have my summers eve cloths and q-tips (large packaging smooshed together). And there you have it! 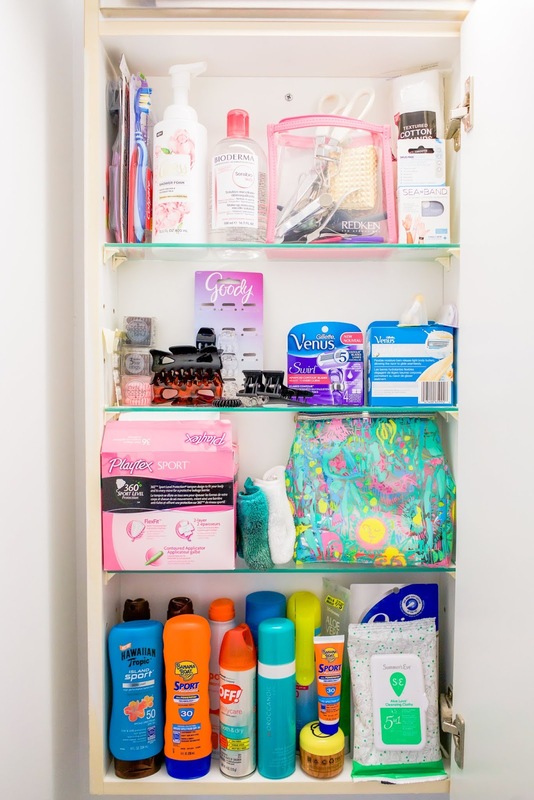 What survived, how I organized (best I could) and whats behind my mirrors! This post turned out so much longer than expected but let me know if you guys like this kind of stuff and I can share more! You did a great job organizing! I need to try the CT magic cream! I really like the Arm and Hammer natural deodorant! My dermatologist recommend it to me after I had a reaction to the Tom's. I'd also look into natural deodorant dry sprays too since they'll be less irritable. What the pills will do is support the blood stream in a male organ so he could accomplish an any longer and harder erection which is imperative in accomplishing better execution.https://tadalafilgen.com/ There are likewise some male pills that are said to bend over a man's sperm tally implying that he's bound to probably imagine.